Energy from the Vacuum is the culmination of 30 years of original thinking and looking with fresh eyes at concepts that are presently considered to be foundations of science—a process of on-going analysis long ago recommended by Albert Einstein. 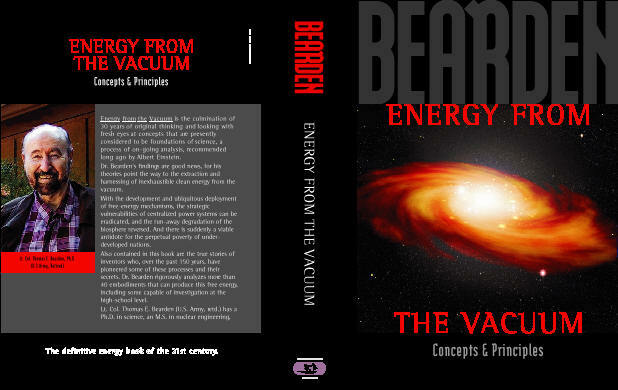 Dr. Bearden’s findings are good news, for his theories point the way to the extraction and harnessing of inexhaustible clean energy from the vacuum. Also contained in this book are the true stories of inventors who, over the past 150 years, have pioneered some of these processes—and their secrets. Dr. Bearden rigorously analyzes more than 40 embodiments that can produce this free energy, including some capable of investigation at the high-school level. Lt. Col. Thomas E. Bearden (U.S. Army, retired) has a Ph.D. in science, an M.S. in nuclear engineering, and a B.S. in mathematics.